Most builders and architects are familiar with the problem of building settlement: the chimney that won’t stop going down, the wall cracks that keep opening up, the older home that suddenly begins to exhibit movement for no apparent reason. Everyone in the building industry has a story about a fix that “shoulda done it,” but didn’t. Preventing settlement problems begins with the recognition that the soil a foundation rests on is part of the foundation system; it’s a building material, just like the 2×4 studs that frame the house. 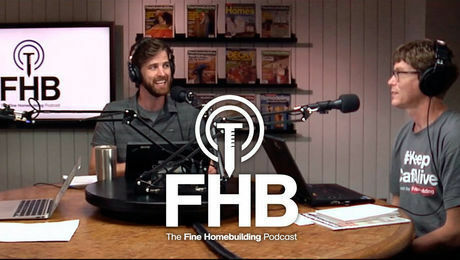 The fact that you can’t go to a lumberyard and select this building material — that in most cases you’re simply going to use whatever you happen to have — makes it especially important that you recognize differences among soil types, know something of the way soils respond to building loads and be able to identify potential problems. A few things need to be understood about settlement. First, all houses settle. The amount may be so small as to be undetectable or may be so uniform as to leave no signs, but it unquestionably happens. Second, because of the natural and construction-related variations in soil properties, not every point on a foundation settles the same amount. 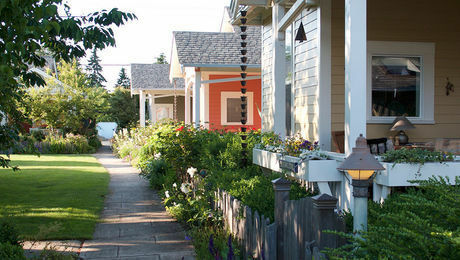 To avoid problems with entrances and utility connections, total settlement must be minimized. 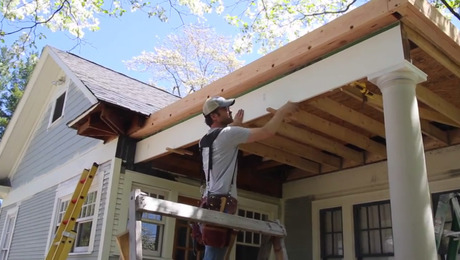 To avoid racking door frames and cracking walls, you must prevent differential settlement, the difference in settlement between various points on the foundation. The distinction between total and differential settlement is important. The Palace of Fine Arts in Mexico City, for instance, has settled several meters without significant distress to the structure and remains in service because the settlement has been uniform. The Leaning Tower of Pisa, on the other hand, is useless for anything but the Kodak moments of tourists. Fortunately for homebuilders, the loads involved in most residential construction are relatively light. Following time-proven procedures and steering clear of some common misconceptions will keep you out of trouble in most cases. For starters, you can learn a lot about soil conditions on your site by taking advantage of public-sector resources. The United States Department of Agriculture (www.usda.gov) has prepared soil maps for most of the country. Available at no cost at any local USDA branch office, these maps superimpose soil-type delineations over aerial photographs. By studying these maps and the soil descriptions that accompany them, you can find out information such as whether your site might have a high groundwater table or whether problematic soils — such as shrink/swell-susceptible clays — might lurk beneath the surface. Having been taken 30 years ago or more, aerial photos often reveal evidence of unsuspected development or manipulation of the site. An even better source for this type of information is a topographic map from the United States Geological Survey (www.usgs.gov). This map may reveal abandoned cemeteries, farm ponds, wells or the long-forgotten town dump. 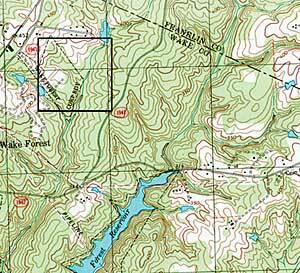 A topographic map may be purchased for a few dollars at outdoor-sporting-goods stores or downloaded at no cost (www.topozone.com). Serving as snapshots in time, soil maps and topographic maps can provide valuable insight into human activity that has taken place on land (see Two ways to look at the same piece of land). Don’t forget to check with the local building and engineering departments, as well; they often have a wealth of local information and experience, which they are usually happy to share. Developers who have built close by or homeowners on adjoining lots are other good sources of information. Soil maps from the U. S. Department of Agriculture are actually aerial photographs with soil types superimposed on them. 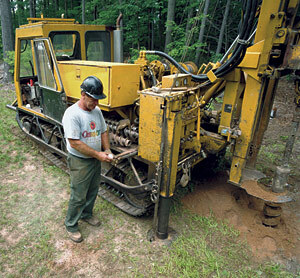 They can alert builders to problem soil conditions before they start digging. 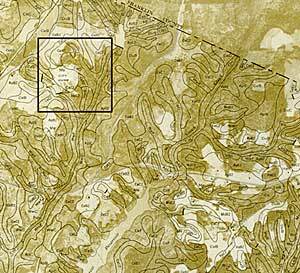 Topographic maps from the U. S. Geological Survey can reveal wetlands or intermittent streams. 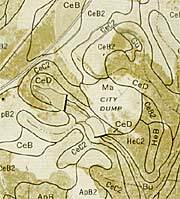 USDA soil map USGS topographic map City dump? The soil descriptions that accompany this map indicate that except for the suspicious area in the center (Ma signifies man-made soil), all the soils delineated in this close-up are builder-friendly sand. The two straight, bold lines to the left of the dump represent dammed lakes. What city dump? 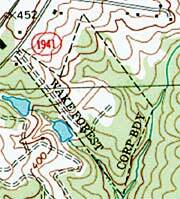 Although a topographic map is generally the better indicator of previous development, a builder who relied on only a topo map in this case would not be able to tell that the lakes were man-made and, more important, would have no idea that his dream land was once the city dump. If your research unearths potential problems, that’s the time to bite the bullet and consult an expert (see When should you call in a soils engineer?). If you uncover no history of activity that may have left problems behind, that’s probably good news, but there may still be things that need attention. “Virgin soil” isn’t inherently problem-free. Muck (decomposed organic material), for instance, may have been undisturbed since Mother Nature deposited it, but building on it is always a bad idea. Clay can also be troublesome. The strength of clay soils varies inversely with changes in moisture content: the greater the moisture, the weaker the soil. If clay materials underlie your site, the site plan must provide for positive drainage that will direct surface water away from the structure and paved areas; otherwise, water may penetrate and weaken the supporting soil. This is, in fact, a common cause of post-construction settlement problems. If site constraints make it impossible to direct runoff away from the driveway, you should plan to provide lateral drains alongside the driveway to prevent water from accumulating beneath the pavement. Foundation drains must also be carefully designed to carry groundwater well away from the structure. These measures aren’t cheap, but they cost less than repairs, ill will and neighborhood gossip. What if there’s a wet, loose, soft, low or mucky spot on the site? Can you bridge it with fill? Geotechnical engineers like me have a couple of easy rules of thumb that we refer to when called to a site and asked what to do. After that, it gets complicated. Rule one: Never fill a low spot with surface strippings, shrubs or woody debris, no matter how much clean fill will be placed on top of it. It might take years, but the organic material will inevitably decompose and cause settlement. Rule two: Muck must be removed. Although it’s possible to force sand and gravel fill into the muck and create a stable mixture, that’s not a reliable solution. What usually happens is that pockets of weak material become scattered throughout the reworked material, and these areas slowly compress over the years. To control settlement problems, soils engineers want the foundation to rest on stable, compacted material that extends at least half of the influence depth, the distance beneath the footing that its weight is still “felt” by soil particles. Square foundations (such as those beneath a Lally column) stress the soil to a depth equal to about two times the foundation width. A 2-ft. by 2-ft. pedestal, for example, is “felt” by soil particles to a depth of about 4 ft. below the foundation. A strip foundation, one whose length is ten or more times greater than the width, e.g., a wall foundation, stresses the soil to a depth equal to about four times the foundation width. Thus, an 18-in. wide foundation is “felt” by soil particles as much as 6 ft. below the foundation. 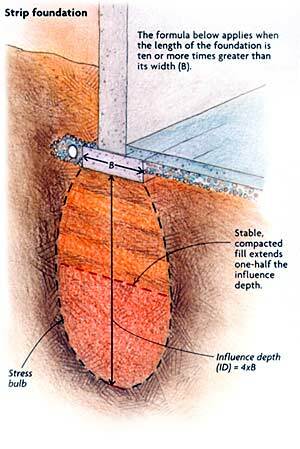 The maximum stress for either type of foundation occurs at a depth of about one-quarter of the influence depth. 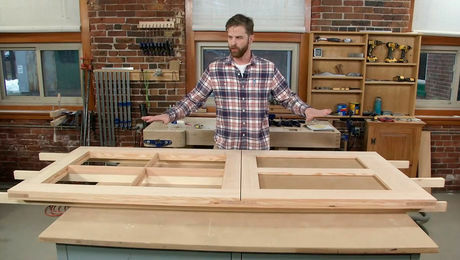 What all this means to the builder is that for the pedestal I just described, you must provide at least 2 ft. of competent support; for the strip, you must provide at least 3 ft. If that can’t be done with the existing soil, you should plan to remove and replace the undesirable material and restore the site to grade with engineered fill. To prevent settlement problems, soil that is stable and compacted must extend at least half the distance from the base of the footing to the influence depth (the farthest distance beneath the footing that its weight is felt by soil particles). 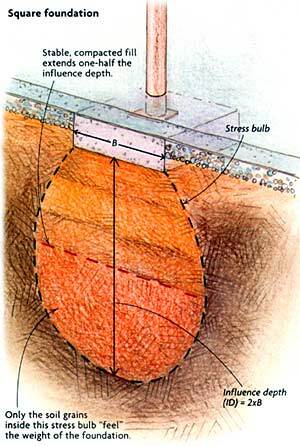 Strip foundations (such as the wall on the right) stress the soil more than square foundations (such as the pedestal on the left) and thus have greater influence depths. One of the misconceptions I often encounter is the belief that soil will densify and strengthen if it’s merely dumped on a site and left undisturbed for several months–that fill dumped in a low area in the fall will be ready to support construction in the spring without any compaction. To this opinion, I always respond: “‘Fraid not.” To understand why, think back to your high-school physics class: “An object at rest tends to remain at rest unless acted on by an outside force.” Loosely dumped soil does not densify and strengthen by itself. It is particularly important that fill be placed in thin layers so that the densification effect of the compaction equipment is felt all the way to the bottom of each layer. The maximum thickness for each layer varies depending on soil type: ordinarily about 12 in. for sand and 6 in. to 8 in. for clay. The required degree of densification is usually set forth by the local building code and specified as some percentage of maximum dry density as determined by one of several standard methods. 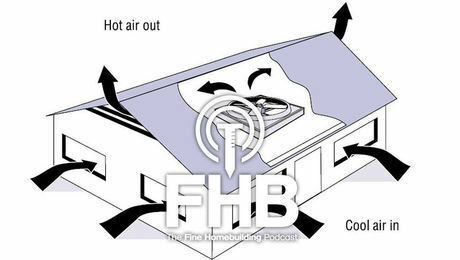 The moisture content of the fill material must also be controlled. If the moisture is too low, it is difficult for individual soil grains to realign themselves into the densest configuration; adding moisture lubricates the grains and makes realignment easier. But if there is too much moisture, the soil becomes unstable under the influence of compaction equipment because a portion of the compactive effort will be borne by the water between the soil grains and result in a water-bed-like rolling of the soil. Granular soils such as sand are most desirable for use as fill because their moisture content can be easily tweaked. 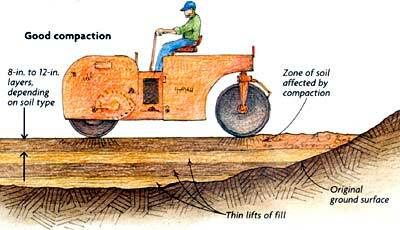 To minimize settlement and to ensure that the foundation is properly supported, fill must be placed in thin layers, and each layer must be individually compacted. 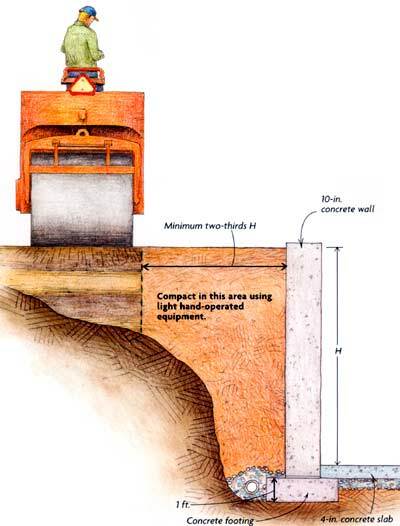 Compacting soil against below-grade walls also requires special care, lest the horizontal load imposed by the compaction equipment damage the walls. A good rule of thumb is to keep heavy equipment away from the wall a distance of at least two-thirds the unbalanced height of the fill. In other words, if the fill on the outside of the wall is 6 ft. higher than the fill on the inside, the big rollers should be kept at least 4 ft. away from the wall. The strip of ground adjoining the wall should be compacted using small, hand-operated equipment. But make no mistake: It should be compacted; failure to compact is what leads to cracking sidewalks and uneven driveways. It is equally important to assure that fill placed in utility-line excavations be properly placed and compacted. Improper placement of fill by the plumbing contractor, for instance, not only causes drain problems but frequently leads to exterior-wall settlement and cracking over buried drain lines. 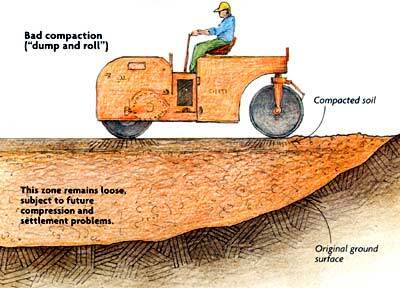 To avoid damage from the horizontal loads imposed by compaction, heavy equipment should be kept away from the wall a distance of at least two-thirds the unbalanced height of the fill. In spite of your best efforts, what if the new homeowners call your office and demand that you come over right away to inspect a crack they’ve just noticed? You have not only a public-relations problem, because previously unnoticed hairline cracks suddenly become subjects of concern to the buyer, but a real technical problem, too: You’ve got to figure out what has happened. The act of building the house changed the local groundwater conditions. In particular, the shallow soil zone beneath the house is drying. The minor settlement that results can be enough to cause hairline cracking. When you painted the house, it was empty. When the owner took possession and brought in the home gym, water bed and baby grand, this stress inevitably caused flexing of virtually all the structural members. This, too, can cause hairline cracking. Of course, there may be times when simple explanations don’t suffice, when something strange seems to be happening. The best way to identify the cause of the problem is to install a crack monitor (Avongard Products; 800-244-7241; www.avongard.com), a two-piece, specialized ruler that is semipermanently mounted over a crack. Using a crack monitor spares you the work of trying to decide by eye and memory whether a crack has grown or changed. If it appears you’ve got a real problem, the data will be invaluable to whoever is trying to figure out what’s causing the crack and what ought to be done because different settlement mechanisms leave distinctive signatures, which become apparent when the data are graphed. The correction of foundation problems requires thorough investigation by experts. You should not hire a grouting contractor to “mud-jack” (pump concrete beneath a distressed area) until the cause of the distress has been positively identified. If a house corner is settling due to the presence of buried, compressible organic material, for example, pumping a yard or two of concrete into the soil immediately beneath the foundation will increase the load over the soft material and thus increase settlement. 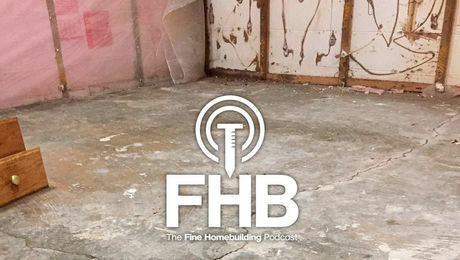 The wall may look fine when the contractor cleans up the job site and leaves, but more irate-homeowner phone calls are inevitable. When making repairs, just as when beginning a project, you should be guided by a single rule: The best defense against future problems is doing it right the first time.